I love strawberries. Love, love, love them. Strawberries and asparagus are my two harbingers of spring. When you see them at the farmer’s markets, winter is over fo’ sho’. Like many of the most precious things in life, strawberries are fragile and temporary. Fresh strawberries are so far superior to their hard, dry grocery cousins that I will usually forego buying strawberries at the grocery and instead, wait until I can eat them to my heart’s content, fresh from the fields. 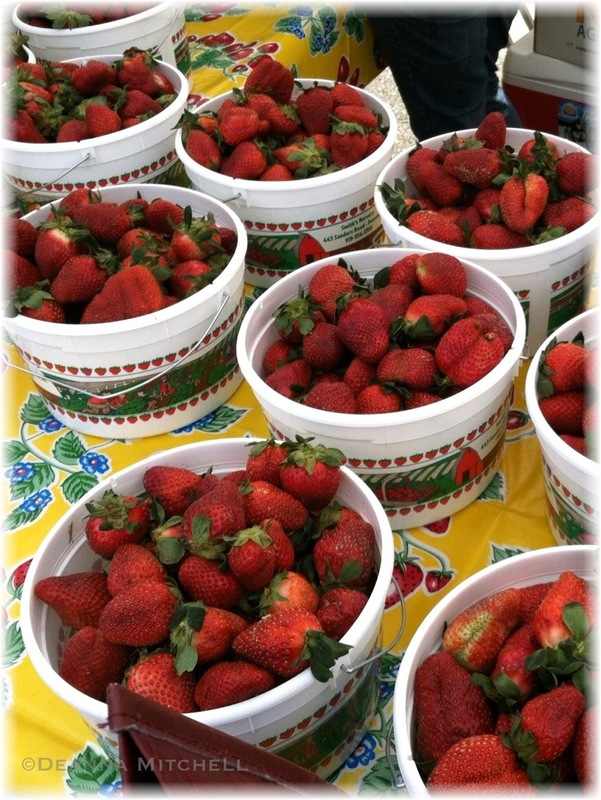 But if you are eating (mostly) local as we are, how do you continue the strawberry love all year? There are lots of ways to preserve your berries so you have some wonderful flavor all winter long. Canning preserves, of course, is a great option, but don’t forget freezing and drying as well! Your freezer is probably your most overlooked ally in reducing food waste and stalling the effects of time on your precious berries. Last year, we purchased a second freezer and we used it all summer to pack away berries, peaches, tomatoes, figs, corn, beans, okra–pretty much anything that was plentiful and at the peak of the season. Our freezer is running low now, but we’ve had a winter’s worth of wonderful meals and we’re getting ready to stock it up once again! With strawberries, you can make freezer jam or just freeze the whole berries for use later. One of our favorite restaurants, Lucky 32, has a great Farm-to-Fork blog about preserving strawberries HERE. Check it out! I’m definitely trying the vinegar idea this year–not only does it sound delicious, it uses up those bruised berries that sometimes get put in the compost (well, not in our house–they usually end up in my mouth). Put ‘Em Up was my canning and preserving bible last summer. My copy is so dog-eared, stained and sticky that it’s a surprise I can still turn the pages. One aspect I really like is that her jam recipes use Pomona’s Universal Pectin, which is a bit more expensive, but allows you to decrease the amount of sugar you use without compromising the texture of the jam. I just ordered her new fruit book and can’t wait to try the recipes. Strawberries are so fresh and sweet, why mess them up with more sugar than needed? I love this book so much more than the Ball canning books because the recipes are creative and absolutely spot on with measurements. Also, she includes other preserving methods, such as drying and freezing, so if you don’t can, you can still find lots of useful ideas. Consider buying a dehydrator. This is my summer project. Have you ever had dried strawberries??? Holy moly! They are amazing and last a good long while. Wonderful on cereal, in granola or just as a snack–nature’s candy, indeed! You can dry strawberries in your oven as well–just takes a little more attention on your part, but completely do-able! Make fruit leather. Once you make homemade fruit leather, you will never touch that pre-packaged stuff from the grocery again. And you kids probably won’t want to either. We made homemade strawberry fruit leather last spring (read about it HERE)and we all agreed it was so strawberry-delicious that we needed to make more. Immediately. Except then, we ate all our strawberries. Oh, well, we will try again this year! I’ll be sharing more of our berry recipes as we head into high season! I just need to remember to sock some away for November and December, when we are feeling deprived of fresh berries! Made my first strawberry (balsamic) preserves after taking a canning class. A little less stiff than I would’ve like but delicious. I think the balsamic vinegar makes the jam a little softer. I’ve had the same issue, but delicious all the same!